Our range of A to A++ cassette units are available as a compact 600×600 (2.5 to 5.0Kw) and 4-Way Cassette models (5.0 to 14.0kw). The compact model being the perfect fit for a 600 x 600mm grid system ceiling with the units measuring 575 x 575mm, therefore reducing the need to cut ceiling tiles. 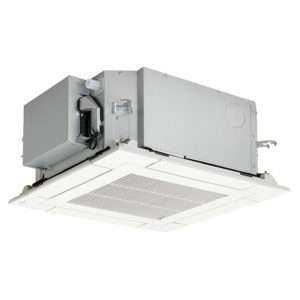 The 4-Way cassette model provides the user with multi-louvre individual control that enables air flow to be chosen according to the user’s preference with 3 different choices of swing pattern. 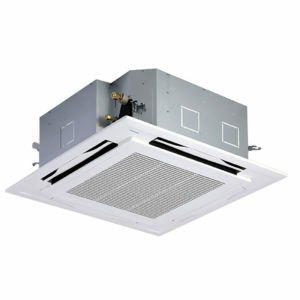 The units are designed for simple and easy installation and maintenance, easy access to the electrical box is achieved by simply removing the suction grille. 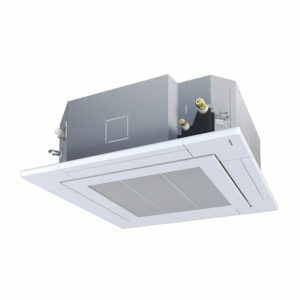 Easy installation is possible using the panel adjust pocket, this is used also for fine adjustments after installation.